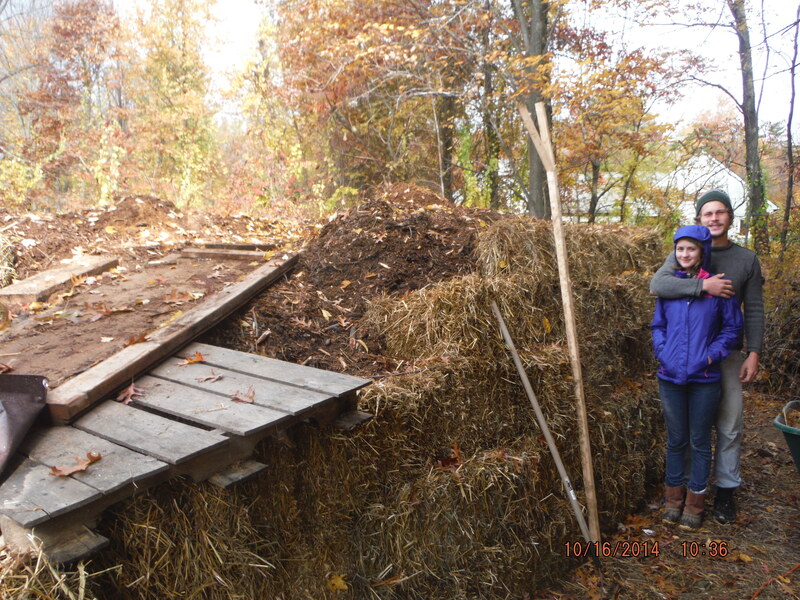 Almost Finished with the Compost Furnace Pile ! 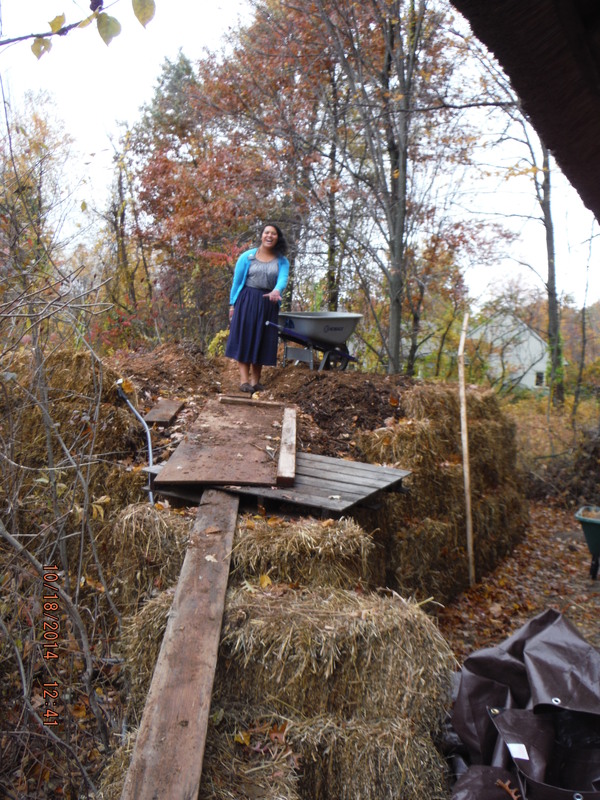 Shihaiya and Thomas helped on the project from planning & clearing the land, picking up materials & hay bales, and building the pile through the 5th layer of strawbale ! Thanks ! From Oct 8 – 12 we worked on the pile and came close to completion. We will round it up in the next few days, using up all our materials and having about 60 yards of biomass (feedstock) piled within 105 bales of hay donated by farmer Wez Ligon of Almont who raises hay and does hay bale gardening. These are bales which have been rain damaged and thanks, thanks for your generousity, Wez. We created a ramp with strawbales, boards and pallets, to get our wheel barrow full of biomass up onto the pile. The pile needs to be wet in order for microorganisms to live and digest the bio materials, so we had the hose going a majority of the time we were loading up the pile with the feedstock. Shredded wood from the Enbridge Pipeline coming through the land. 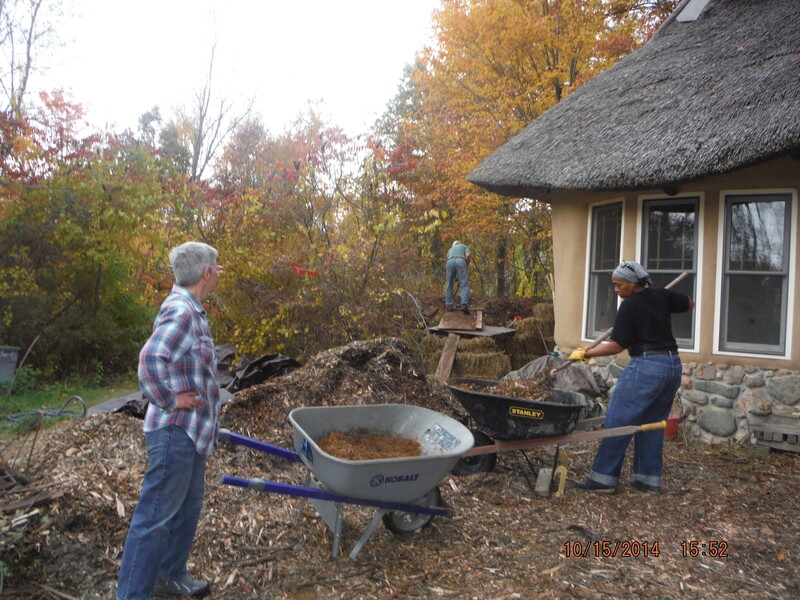 Sawdust was donated by Father & Son Landscaping with help from Jason from the Permaculture Meetup Oakland Co.
Wood chips donated by Robert th th at Nelson Wood Products west of Lapeer, MI, Thanks! 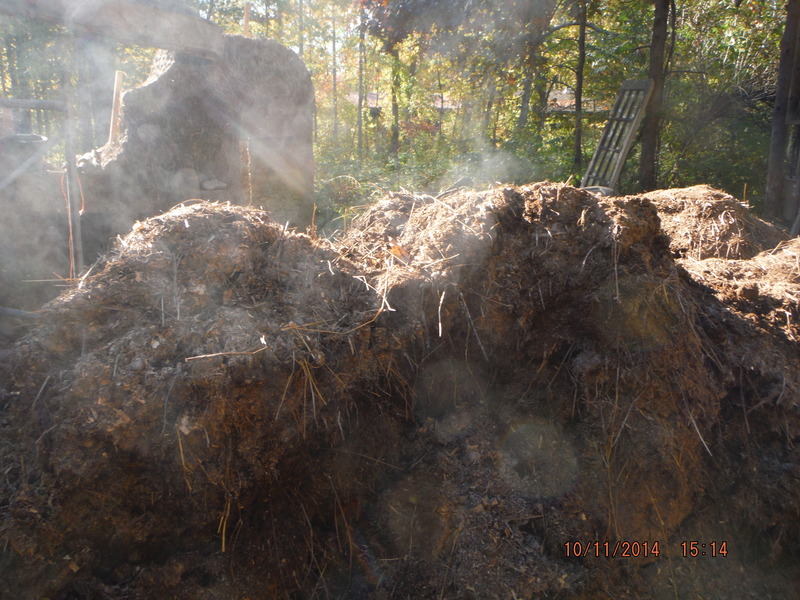 The horse manure was amazing and innocuous. Shredded with a machine, the horse pellets were broken down and mixed with the sawdust that was the bedding for the animals. 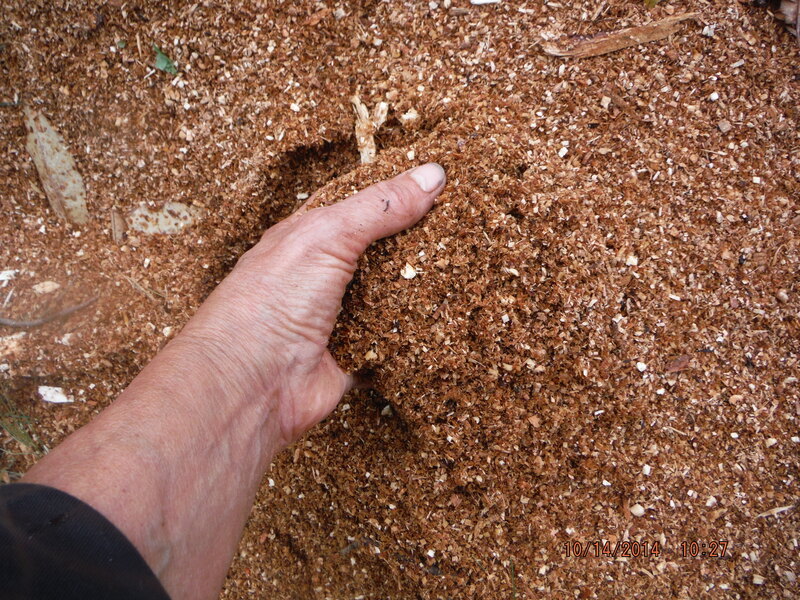 High in nitrogen, with carbon in the sawdust. A good combination for decomposition organisms as I understand it. So hot it steams ! Tube on the left brings air underneath the pile. The 2 tubes on the right contain insulated pex tubes ~ hot supply and cold return. Rosalind and Steve dropped by and helped, and Ros baked a pizza in the Earth Oven. Oh yeah! 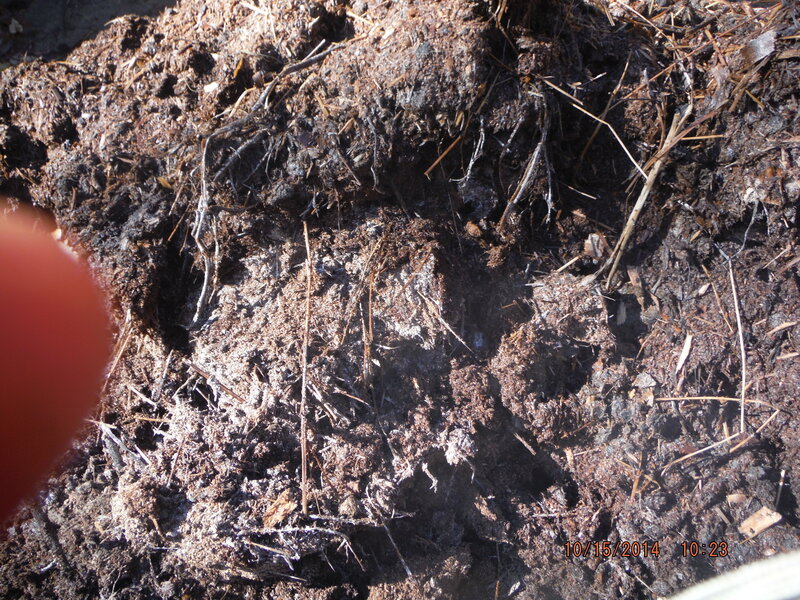 Info on how compost produces heat. 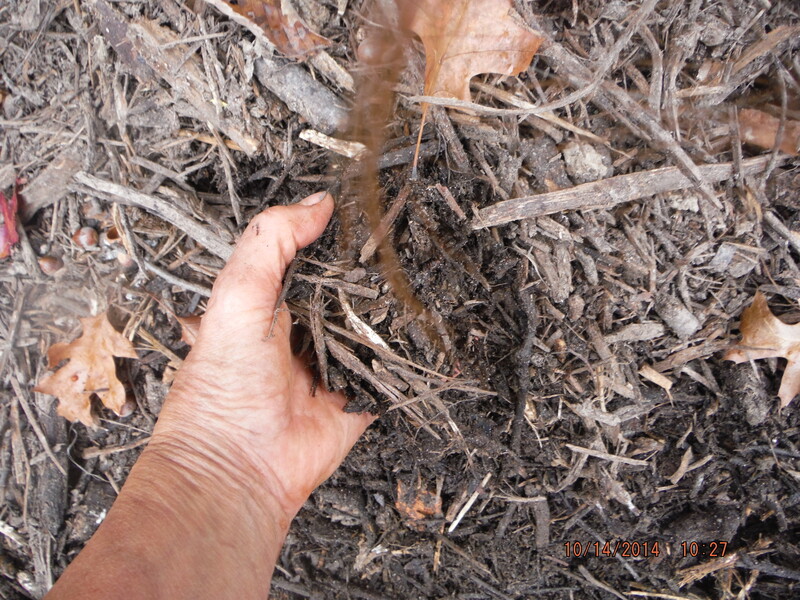 Mother Earth News article on Jean Pain Compost Furnace Techniques. 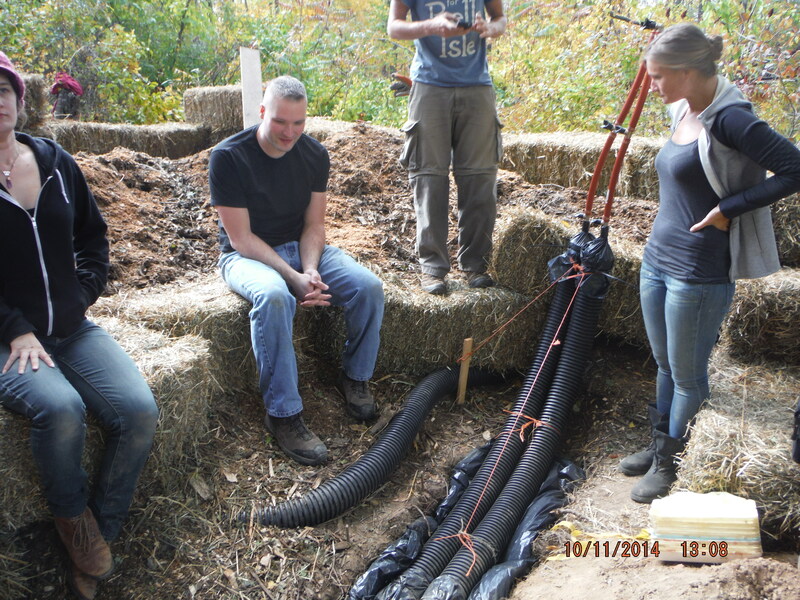 Compost Furnace inventor ~ an article about Jean Pain and the process. 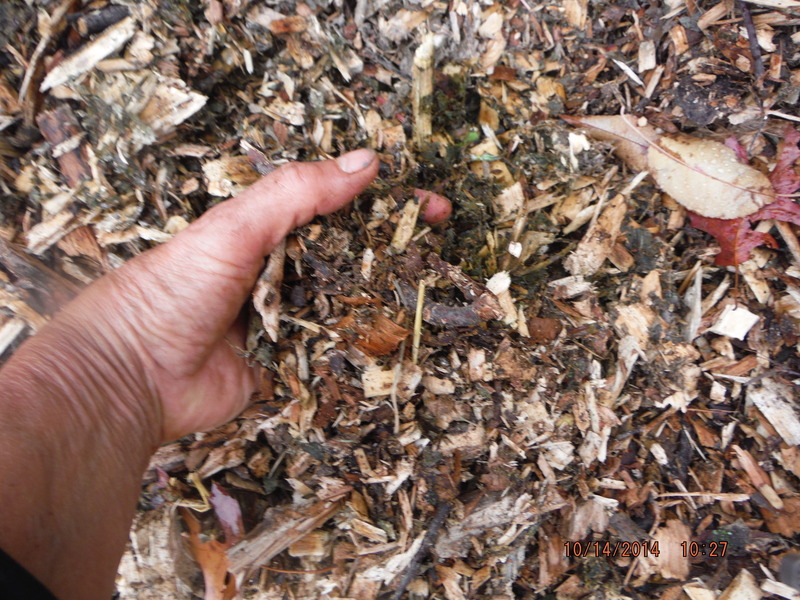 COMPOSTING FURNACE ~ an update !